I've been trialling O.P.I's Chip Skip. Let me just start off by saying that I was skeptical at first. It's a product you apply to your nails before you put your base coat on, it dries in seconds and is clear. It claims to prevent chips, and it really does what it claims! Your polish won't chip for a week or more. I've been wearing my polish since Wednesday last week, it's been 8 days since and not a chip in sight. Usually I start getting chips in a day or two! So the product does work, and I would definately recommend it. 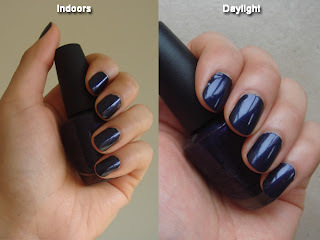 The colour I'm wearing is Russian Navy by O.P.I. I wanted to get a really dark, almost black colour and I found it! It's good to wear with dark denims. I am definitely going to try O.P.I because I have been looking for anything that will make my nail polish last longer..
Hey dear, I have tagged you! This one is pretty fun! and in knowing when he's writing all those NEW numbers, is it trying to indicate the new place he's starting over at?? I was so curious about that!.. and what about those other people that are "the chosen one"?? Love the shine it gives!